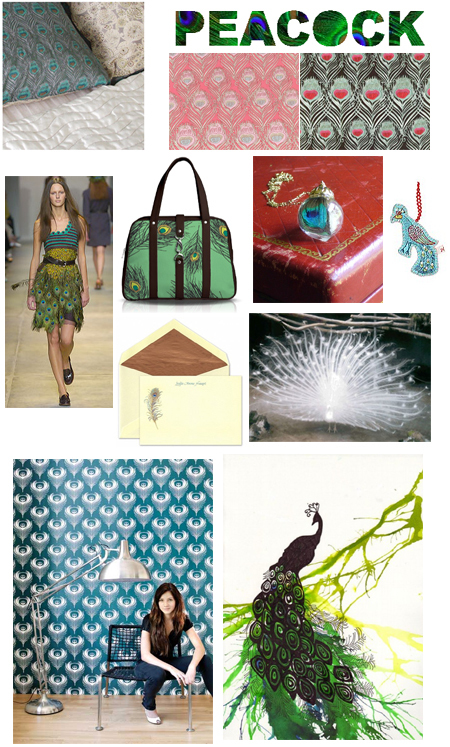 Today's Tuesday Trend showcases the lovely plumage of the peacock. Oh Joy! shows off her reversible Tana Lawn pillows (swatches of Tana Lawn's fabrics at right). One of two Peacock Ornaments available at Anthropologie. Mid Century Jo print and fern LIVING wall via Belle Vivir who also had a great post on peacock. Hooray! I'm not alone! Crane & Co.'s luxurious Black Label stationery with engraved peacock feather. The Prada 2005 runway show featured a few peacock feathered garments. Freddy & Ma custom peacock bag (shown with chocolate leather). One of my co-workers asked me how I know if something is a trend versus something that I like and happen to notice or look for. I didn't really have a good answer for him. I think this ties in a bit with the whole use of natural elements in fashion trend. Feathers were featured prominently in the Fall 07 runway shows and designers like Nina Ricci, Alexander McQueen and Jean Paul Gaultier showed off some plumage in their Spring 08 shows. So it isn't as though I'm going out of my way to showcase my newest obsession. What do you think? Is peacock played out or is it part of a fully hatched trend?